Saturday: Long nap, Macy's Christmas displays, Empire State Building, Bryant Park, Library, another long nap, overcrowded bakery, Central Park, Guggenheim. Sunday: High Line Park, Grand Central Terminal, lunch with a friend, St. Patrick's Cathedral, long nap, Italian dinner. Monday: Return pack-n-play, chocolate babka, train to Newark, fly home. Saturday got off to a somewhat slow start. After our complimentary breakfast at the hotel, Frugal Babe took the longest nap ever, so we didn't get out of the room until almost lunch time. When we finally did we walked south toward the Empire State Building. Along the way we stopped at Macy's to admire the beautiful Christmas displays in the windows. Once we determined who was naughty and nice, we made our way to the Empire State Building. We didn't go inside, but it was really cool seeing it in person and observing all the art deco details you don't realize are there when you see it in photos. We also chose not to go to the top of it or any other tall buildings because Chrissy isn't a big fan of heights and every building (by complete coincidence and definitely not a case of price-fixing) charges $34 per person, which seems a bit excessive. By this time we were famished so we stopped at a deli/cafeteria and had a quick lunch, which included a healthy slice of New York cheesecake. Lunch was followed by more walking to Bryant park, where there was another craft market and ice rink, along with another beautiful Christmas tree. However, the best thing in Bryant Park is the New York Public Library. Quick tip: use the side entrance to avoid crowds at the front. The library was one of our favorite places we visited. It was particularly nice for us because there was a children's area where we could put Frugal Babe down and let her crawl around. She hadn't been able to do that for a couple days, and she had a great time exploring and making friends. The library itself is also an incredible structure, with magnificent stone walls, painted ceilings, and intricate carvings. The main reading room is pretty remarkable, with it's ~40 foot ceilings. Who knew you needed so much headroom while reading? Of course the best part is the pair of lions out front. After the library, Frugal Babe was very ready for a nap, so we walked back to the hotel and she took another very long one. Once the nap was done, we were ready to venture out once more, and this time we hopped on the subway and headed north toward Levian Bakery and their wold famous cookies. Unfortunately, when we arrived, there was a line down the block, so we skipped it and started walking toward the Guggenheim, which has "name your own price night" for a couple hours every Saturday. That required us to take a fairly lengthy walk straight across Central Park, which was almost completely abandoned once again. When we finally got to the Guggenheim, there was only about a half hour until closing time, so we didn't feel too guilty only offering a few dollars for admission. We didn't get to see too much of the art, but I was most interested in the architecture anyway, which I had plenty of time to admire. When we left the museum, Frugal Babe was very ready for bed, but getting back to the hotel wasn't super straightforward, and we had to take a pretty long walk followed by two different subway lines. 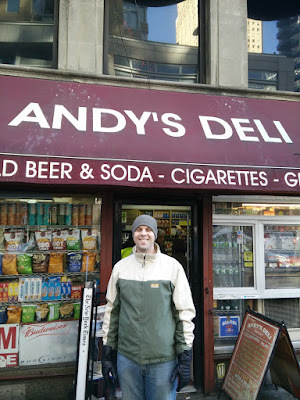 On top of that, we still had to get dinner, so we stopped at a deli a couple doors down from our hotel and got very tasty sandwiches along with a salad. On Sunday I was determined to seize the day, so I insisted on getting out of the room before the first nap of the day. We took an Uber to High Line Park, which was highly recommended by everyone we asked about New York. They also said to get there early before the crowds, which was good advice. We walked the entire length of the park and really enjoyed it, especially the guerrilla yoga. After the High Line, it was nap time once again, so we returned to rest up for our lunch date. Before the trip I had contacted a childhood friend who was now living in New York and made arrangements to meet for lunch on Sunday. We chose a nice restaurant near his office and we decided to walk there. On the way we stopped at Grand Central Terminal, which was pretty incredible. I really appreciated the minimalist constellation painting on the ceiling. When we got to the restaurant, we had a very tasty meal while we caught up on each others' lives. Afterward, our friend showed us his very cool office building, where he was going to continue working after we left, even though it was Sunday. No rest in New York. After our long lunch, we were walking back to the hotel for nap number two, but we made a very quick stop at St. Patrick's Cathedral, which was just as glorious as you might imagine. Frugal Babe took another marathon nap, so when she woke up it was time for dinner. We decided to make this our one nice meal as a family, so we went around the corner to the Italian place I got pizza from two days before. The food was excellent and Frugal Babe had everyone fawning over her, including the owner of the restaurant. After the delicious meal we went to bed very content, because we had seen just about everything we wanted to in New York, and we were ready to go home the next day. Our flight was in the mid-afternoon, so we weren't in a big rush on Monday. After breakfast, I took the pack-n-play we bought just days before on the subway and returned it to the Manhattan Babys R Us. This might not be the most ethical thing I've done, but we had legitimate complaints with it that warranted returning it. Most critically was the material on the mattress portion was very plasticy and crinkled loudly whenever the baby moved. I actually arrived before the store opened, so I took the opportunity to go to a nearby bakery and buy some famous chocolate babka, which we brought home and shared with family at Christmas. After returning the crib, I chose to walk the two miles back to the hotel because I enjoy walking and I had used the last of the credit on the Metro card. I'm glad I did, because I got to walk right by the Flatiron Building and see the Empire State Building one more time. When I got back to the hotel we decided to get some lunch to eat on our train to the airport. This is when we found the best place in the city, Andy's Deli. Not only do they have a great name, but the sandwiches are cheap and tasty. With sandwiches in hand, we summoned an Uber and headed for Penn Station. Once we were there, we bought tickets to the train that would take us back to Newark and waited for them to announce on which platform we would board. When they did announce it, there was a mad rush to board, but we easily got seats and were able to enjoy our sandwiches on the relatively short ride. I also had a couple beers left that I had to finish off before we went through security. We had to switch to a second train that would actually take us to the airport, but it was very simple and we found our way to our terminals without any problem. Since Chrissy and I were on different airlines, she had to fly alone with the baby again. Luckily, both of our flights were on time and we made it home without incident. This wasn't the cheapest possible way to visit Manhattan, but we did pretty well considering everything was booked last-minute and we had to make concessions for a baby. Decide what you want to do and see beforehand and make a chart like we did that describes where everything is. It makes it much easier to plan your days. Research if any of the attractions you want to see have discounted or free days. 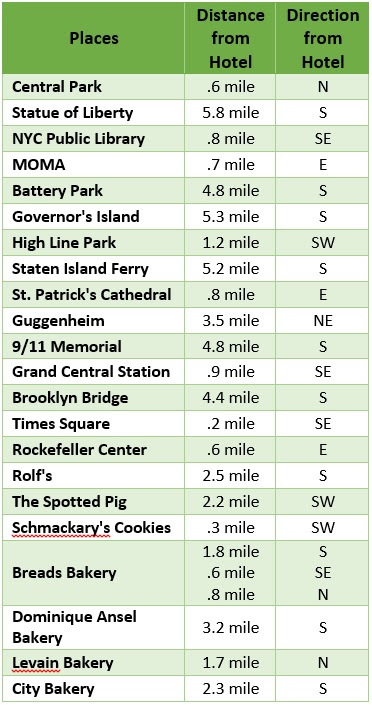 Staying in Midtown worked out really well for us because it was centrally located, however, you could save some money if you stayed in a less popular area. 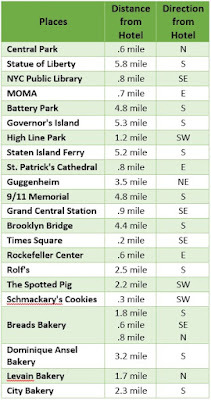 Staying outside Manhattan would save the most, but that wasn't feasible for us with the baby. Remember to check the forecast. It was below freezing one day and muggy the next, so make sure you're prepared for whatever weather New York is going to throw at you.